Over at Stamp and Create we are back this week with a new Product Spotlight Sale and Weekly Candy. A Fairy Good Rest from Belles n Whistles. This weeks product spotlight is Magnolia. All of the Magnolia Stamps are on sale. I used Starter Tilda from the Magnolia Winner Takes all collection. 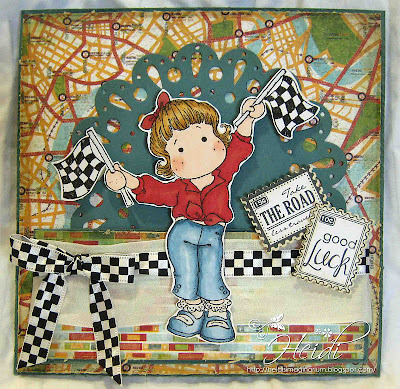 The sentiments are from the Whimsy Adventure Mini Postage Stamps Collection and the Everyday Mini Postage Stamps Collection. Ticket collectionThe paper is from the Basic Grey Wander 6x6 paper pad. I also used the C.C. Designs Cutters Teardrop Lace Die and May Arts 1 1/4" White Silk Ribbon.